Ladders. Where would we be without them? We use ladders nearly every day AND sometimes all day long. It would be tough, if not impossible, to do our job without them. If you've been roofing for a while, climbing a ladder is like walking. You don't have to think about it. But you should. You might carry tools or materials up with you...and you shouldn't. If you can't sling what you need over your shoulders, use a pail or bag fastened to a rope which goes up the ladder. Then hoist the tools/materials up. Are there power lines near the area? Is the soil compact and stable? Is the ladder near vehicles or equipment traffic, or in the kettle area? Is the base on solid ground and/or secured from kicking out away from the building? Is it in good condition with no cracked, broken rungs or rails? Are the latches on extension ladders secured? Is there any mud or slippery substances on the rungs or rails? Is the ladder secured from movement at the top and does it extend at least three feet above the landing? Is the slope of the ladder about 1 to 4 (the base one foot away from the building for every four feet in height)? 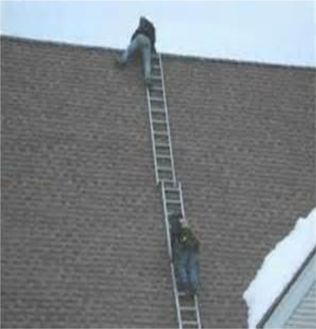 Ladders are an important tool in our business so take care of them and check them before you climb. Don't let coworkers get hurt by a problem you discovered. Tag or remove a damaged ladder to stay safe!